The Freedom Theatre in Jenin Refugee Camp has faced targeted repression by the Israeli Army in recent weeks. 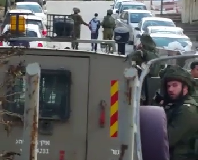 At 3pm on August 6th, 2011, Israeli Occupation Forces arrested a Freedom Theatre actor at the Shave Shomeron checkpoint on his way from Ramallah to Jenin. Rami Awni Hwayel, a 20 year old acting student, was returning to Jenin from Ramallah to visit with family over the weekend during Ramadan. Rami’s acting colleagues and friends describe his arrest as “devastating” as Rami plays a main role in “Waiting for Godot” which is scheduled to perform in New York in early September. Rami has so far been denied his right to see a lawyer, and his loved ones still have not been informed of where he is. Israel is citing ‘security’ concerns for their refusal to release his whereabouts or any other information concerning his arrest. A member of the Jenin Freedom Theatre points to the location where Israeli armed military threw bricks at the theatre, vandalizing it. Rami is the third member of the Freedom Theatre to be abducted by Israeli Occupation Forces in recent weeks. 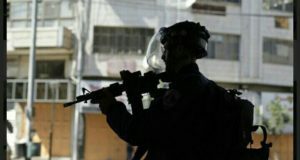 In the early morning hours of July 27th, 2011, Head Technician Adnan Naghnaghiye and Chairperson Bilal Saadi were arrested by Israeli Occupation Forces. The soldiers also caused damage to the theatre, smashing windows with bricks and destroying what they could from their position out in front of the building. Night guard and technician student Ahmad Nasser Matahen was forced to remove his pants by IOF after being ordered out of the theatre. The general manager of the theatre, British citizen Jacob Gough, and the co-founder, Jonathan Stanczak from Sweden, arrived to the theatre and attempted to call the Civil Administration to inform them that the army was attacking a cultural venue. The person in charge hung up on their phone call. The Freedom Theatre is a cultural centre which has operated in the north of the Occupied Palestinian West Bank since 2006. The theatre aims to assist the youth of Jenin in coping with the stresses they face living under continued brutal Israeli military occupation. It serves to provide a safe space where youth can express their emotions through the arts with the aim of constructing a free and healthy community. The Freedom Theatre offers a drama workshop space, acting school, filmmaking and photography studio, library, talent campus, and various performances. Windows smashed by bricks thrown by the Israeli military makes for just some of the damages caused. 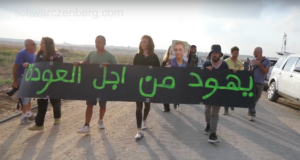 The targeting by Israeli Occupation Forces of the Jenin Freedom Theatre and its community members is one of many instances clearly demonstrates the campaign of intimidation Israel has embarked on in the minds of Palestinians and international observers. Israel continues to repress with ruthless violence those who nonviolently oppose the illegitimate occupation of Palestine.